One of the best things about living in Boston is that a lot of authors do book talks here, including many great writers of history. 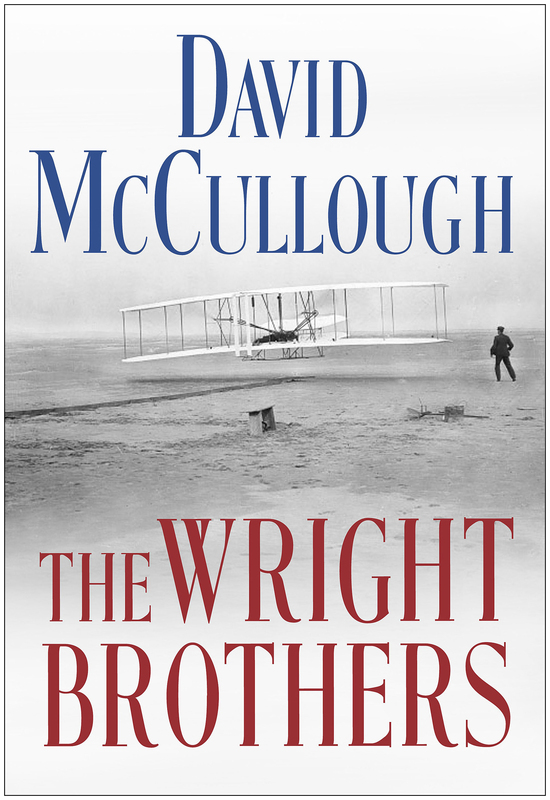 I just got back from one of them, a talk by historian David McCullough about his latest book, The Wright Brothers (2015), a story of brothers Orville and Wilbur Wright, who invented and flew the first successful airplane in 1903. 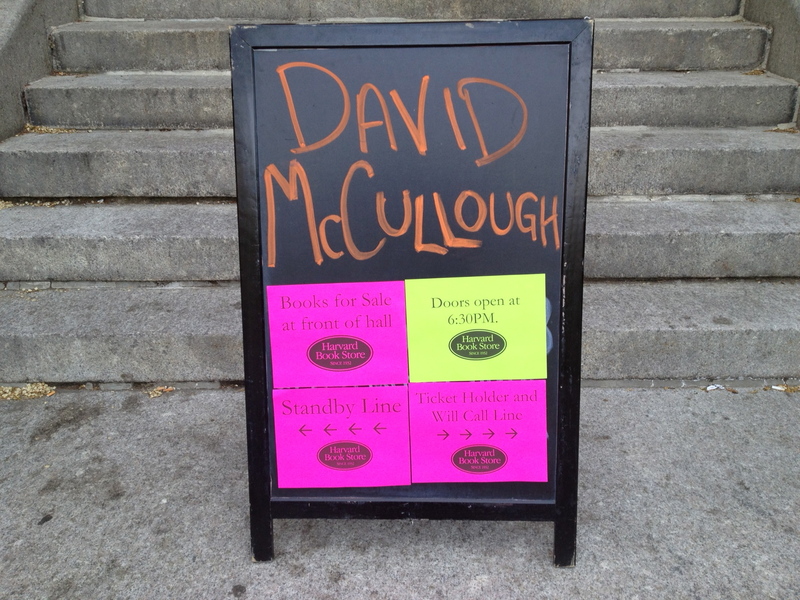 McCullough spoke in Cambridge as part of the Harvard Book Store speaker series to a packed house at the First Parish church. McCullough is one of America’s foremost popular historians, and he is one of my personal favorites. His love of history pervades his books and his public appearances. In addition to being a master storyteller in print, his gravelly but gentle voice and a contagious enthusiasm for his subject matter add a magical quality to a talk or documentary. The ticket holders line stretched for over a block! McCullough confessed that before he started his research, he knew little of the Wright Brothers’ story beyond the basics: Two brothers, owners of a bicycle shop in Dayton, Ohio, would go on to build and fly the first successful airplane, flown at Kitty Hawk, North Carolina. However, as he dug into their story, he learned about how Orville and Wilbur were raised in very modest surroundings by a missionary father who believed very strongly in the power of reading, how their sister Katharine strongly influenced and supported their work, and how an intense devotion to teaching themselves the science and mechanics of flight led to their success. It is clear that McCullough came to admire his subjects, for both their intelligence and their character. The Wright Brothers, he made clear during his talk, had the right stuff. He allowed himself to make broad connections, suggesting that great history is not just about politics and war. He compared the brilliant inventiveness of the Wright Brothers to that of composer George Gershwin. During his prepared remarks and a lively Q&A, McCullough waxed eloquent about the importance of historical literacy. He said that history can be a “wonderful antidote” to the hubris of our present era. He noted that developments we take for granted today may be regarded as breakthroughs many years from now, adding that prognosticating about the future may be futile. “There’s no such thing as the foreseeable future,” he quipped. 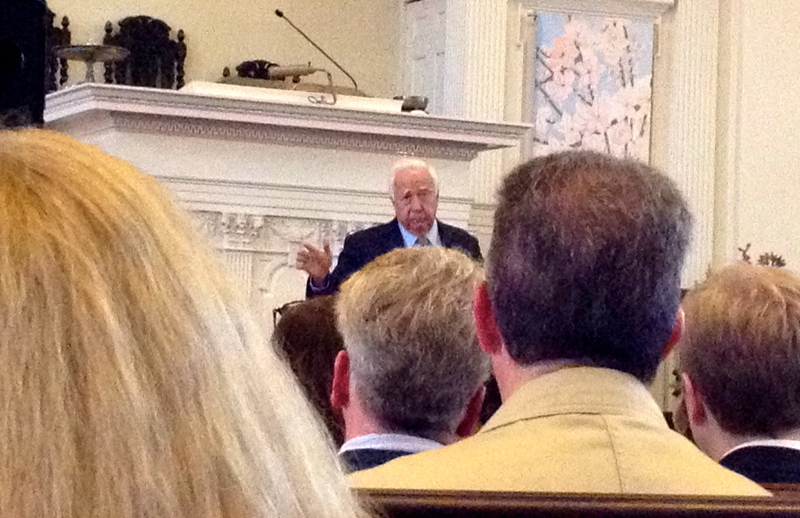 David McCullough is a national treasure, as exemplified by tonight’s audience thanking him with long, warm rounds of applause and a standing ovation. It was just so much fun to be in the presence of this great historian and storyteller.